This is another shout out for a dice Kickstarter. Rick Loomis of Flying Buffalo (the company that publishes Tunnels and Trolls) is doing a Kickstarter to make more of his pizza dice. Pizza dice are a product that Flying Buffalo sells. 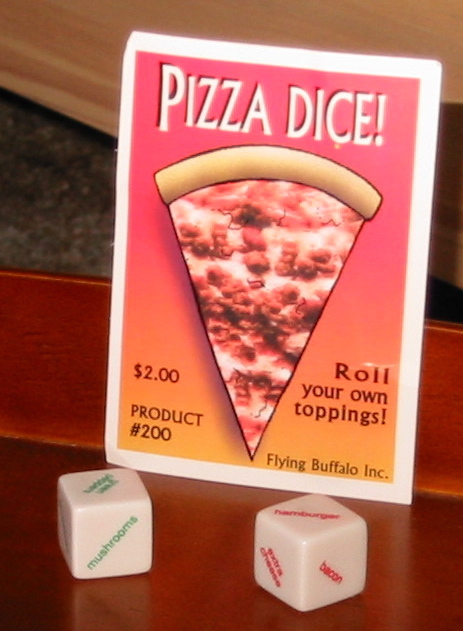 The idea is that you roll the dice and they tell you what pizza toppings to get. The faces of the old pizza dice were printed. The esteemed Mr. Loomis is trying to raise money for a mold, so that the new pizza dice will be engraved. The old pizza dice. The new ones will have the words engraved in the faces. You don't just get two pizza dice with this Kickstarter. For ten dollars you get ten dice. Two pizza dice, five adventure dice (for generating things like traps and treasure), a nuclear die, a monster reaction dice, and a fast food die. My description does not do this project justice so please check out the Pizza Dice Kickstarter. I will end by saying that I have been ordering products from Rick over at Flying Buffalo for ten years. He has some of the best gaming products for the best value around. His customer service is excellent. Plus, he sells one of my favorite rpgs (Tunnels and Trolls! ).